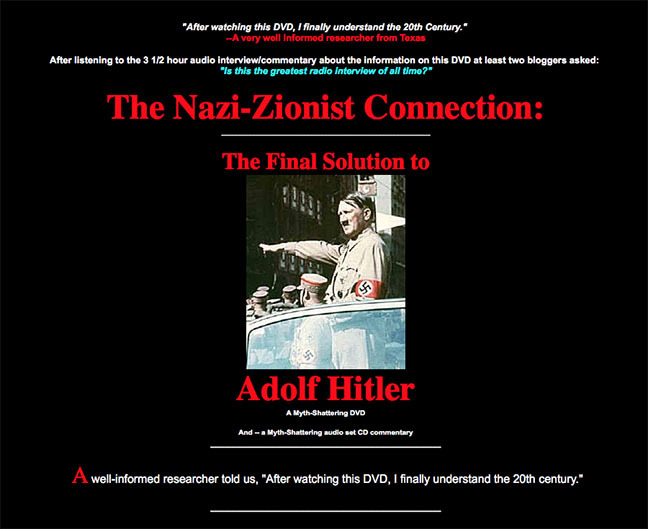 Screenshot of website touting a "Nazi-Zionist connection" DVD by Jim Condit Jr., an election fraud advisor used by the Roy Moore campaign in their Dec. 27 filing. As Roy Moore tries to keep the state of Alabama from certifying the results of the Dec. 12 election, where he was defeated by Democrat Doug Jones for the open United States Senate seat, one of the experts he is using has a lengthy track record of anti-Jewish invective. The 80-page complaint includes affidavits from four “national election integrity experts” who claim fraud occurred in Jefferson County, the state’s most populous county, which went heavily for Jones. Among the four experts is Jim Condit, Jr., of Ohio, who is widely published on the topic of conspiracy theories, especially Jewish ones, and has unsuccessfully run for Congress numerous times. Since the early 1980s he has been an activist on the issue of voter fraud and the hacking of election machines. 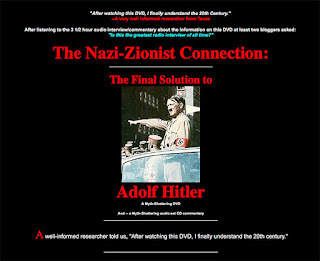 In fact, in a 2006 interview available online, Condit speaks on “Zionism and U.S. Election Fraud,” with the host of the show calling on the world to “forcibly dismantle” Israel. In 2002, Condit started promoting the idea that the Sept. 11, 2001 terror attack “cover story was false” and the operation was conducted by international bankers to bring a 50-year war in the Middle East and a police state to the U.S. He has also aired ads linking the Sept. 11 attacks to Israel. In 2016, he listed the issues he would be promoting, starting with “informing Americans of the existence of the Talmudic Mentality,” which he claimed says non-Jews are not fully human and are permissible to kill or cheat; how “Talmudic Jews” run international banks and the television networks, how “Jewish spies in the USA” perpetrated the Sept. 11 attacks and that the “worldwide Talmudic Jewish Shadow Government” seeks “to make white people of European descent a persecuted minority in Europe and America” and created ISIS as a way to foist refugees on the U.S.
Moore, on the other hand, issued a strongly pro-Israel platform statement during the campaign and attended a function of the Alabama-Israel Task Force in November. Alabama precincts use a paper ballot where the voter fills ovals in, then the ballot is scanned electronically and stored inside the machines. A third expert, Phillip Evans of South Carolina, claims large precincts are places where voter fraud takes place through shifting of votes, because it would be less noticeable, and says he first came up with the theory when looking at results for Rand Paul in the 2012 New Hampshire Republican presidential primary. The Moore campaign has already been criticized for several events related to Jews during the campaign. A fake "Washington Post" robocall purporting to be from "Bernie Bernstein" offering money to women who would make sexual allegations against Moore was seen as feeding into anti-Jewish stereotypes of the media. There was also a story, which remained unanswered by the campaign, about a contribution to Moore's foundation by a group tied to Willis Carto, who has been described as one of the biggest anti-Semitic conspiracy theorists of recent years and also founded the Holocaust-denying Institute of Historical Review, and the election-eve statement by Moore's wife, Kayla, that they have a lawyer who is a Jew and that they "fellowship" with Jews and rabbis. The rabbi in question is "messianic." Alabama Secretary of State John Merrill stated the election results would be certified at 1 p.m. Central time on Dec. 28. The unofficial results show Jones with about 671,000 votes to Moore’s 650,000. He also said that four of the most widespread stories of voter fraud had been investigated and found to be untrue.